Nutbrown is both our longest term and our oldest resident. 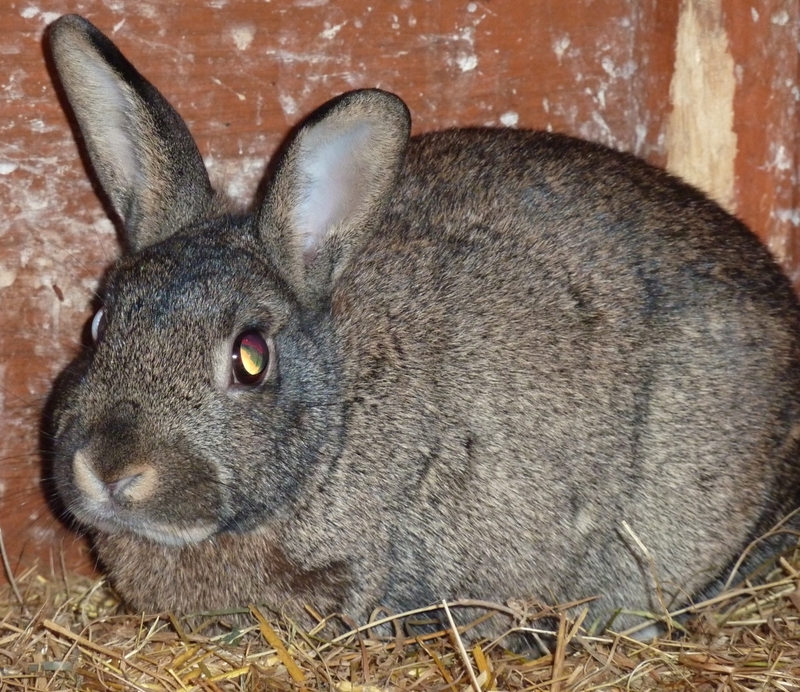 He first came to us in June 2006 with his sisters Marigold and Tulip. 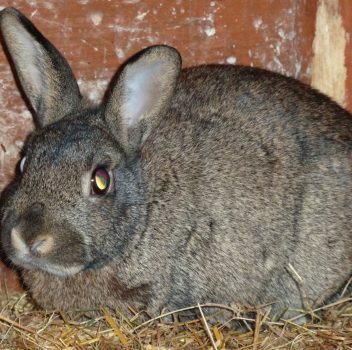 They were an accidental litter produced after their mother, who was a rex, escaped and did what rabbits are notorious for with an undoubtedly handsome wild rabbit. Their half wild heritage meant that we saw very little of Nutbrown and his sisters for the first six or so years they were here. As soon as they heard footsteps they vanished. Handling them was like trying to hold onto a contortionist. They would just about turn themselves inside out trying to twist out of my hands. Luckily they were very healthy and as they were so active they wore their claws down themselves. The only time one of them had to be handled much was when Tulip got herself beaten up after digging into somebunelse’s enclosure. She had some very nasty wounds and needed antibiotics for a week or so. I am not sure which of us found that harder! By the time they were six they would stay visible when I was around as they had come to trust my system of only ever handling the rabbits before letting them out in the morning. This makes catching them much easier. I put the food in the hutch, they jump in, I shut the door. This way we are all happy. They get their food and I don’t have to chase them).By the time they were eight they would stay visible for other people too. By ten not much flustered them at all. Now Nutbrown is now twelve and has outlived both his sisters and several companions after them. He is totally blind and rather stiff. 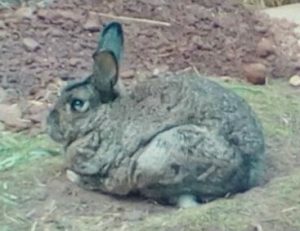 I don’t think he notices people anymore unless he literally bumps into them on his way to have a dig in his burrow or to forage for fallen leaves in his run. He lived with a group of rexes for quite a while, casually assuming that he would get first dibs on the best veg even though they were much younger and stronger than he was. They were a much more loved up group and he got more affection from them than he ever got from his sisters. Even Summer who joined the group after her long-term much henpecked partner died gave up pouncing on the veg after he told her off for her food agression, but was also very sweet with him. Dachs is the only other member of that group still alive. Sadly both Florence and Bambi died quite young and Nutbrown really really missed them. Then he outlived Summer too, who was ten or eleven when she died. 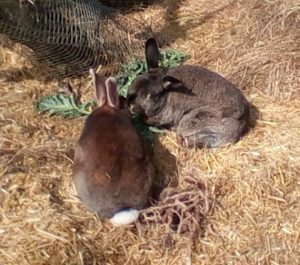 In June 2018 we gave him another two companions, Ivy and Alvin because neither are well and they needed a shed to live in instead of a hutch, and their other partner Fern was being too bossy. Nutbrown has accepted them well and has been more active since they joined he and Dachs.